The Ocean Marsh Resort in North Myrtle Beach, South Carolina is truly a unique and tranquil place to stay for your North Myrtle Beach vacation. When staying at the Ocean Marsh condos in North Myrtle Beach you will have access to and possibly a view of an inviting salt marsh full of wildlife. Only a few blocks away from these North Myrtle Beach condominiums you will find hours of fun on the Atlantic Ocean in North Myrtle Beach, South Carolina. Ocean Marsh is a North Myrtle Beach resort that is only minutes away from unlimited Myrtle Beach area fun and family adventure. You will find the Ocean Marsh condos in the Windy Hill section of North Myrtle Beach, South Carolina and located at 48th Avenue South. Ocean Marsh Resort is surrounded by a salt marsh on two sides of the building. It is located only a few short minutes from the Atlantic Ocean in North Myrtle Beach where you can enjoy the warmth of the South Carolina sand and the cool Atlantic Ocean breeze. It is also located very close to all the excitement and fun that the Myrtle Beach area has to offer. The Ocean Marsh Resort is hidden a few blocks off of Highway 17 in North Myrtle Beach. Once you arrive at your North Myrtle Beach condo at this North Myrtle Beach resort you will be able to leave your car parked in a covered parking place or in the convenient parking lot near the entrance to you North Myrtle Beach condo rental. Take a short flight of stairs or an elevator ride up to where you will find your North Myrtle Beach vacation rental. Ocean Marsh Resort offers a little something for everyone. With the salt marsh only a few steps away you can take a relaxing swim in the sparkling swimming pool or slide into the bubbling Jacuzzi. Let the children splash in a kiddie pool while you enjoy watching birds make their way to the marsh. Take advantage of the two charcoal grills and grill a steak or some jumbo shrimp while your family splashes and soaks up the North Myrtle Beach sun at this wonderful North Myrtle Beach resort. The Ocean Marsh Resort will offer up to nine of your family members or friends an amazing place to stay and relax while you vacation in North Myrtle Beach, South Carolina. Rest your mind and your body at the beautiful Ocean Marsh Resort while you vacation in North Myrtle Beach, South Carolina. You can choose a two-bedroom, two-bathroom or a three-bedroom, three-bathroom condo rental for your North Myrtle Beach vacation. 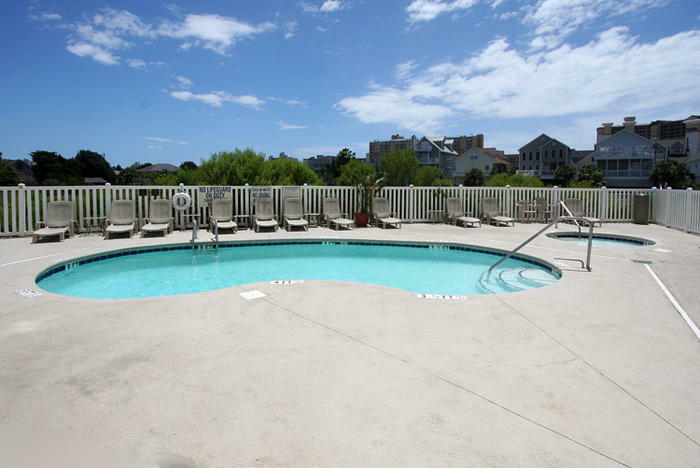 At these North Myrtle Beach condos you will be able to end your day soaking in the Jacuzzi tub that you will find in your North Myrtle Beach vacation condo. Whether you choose a luxury condominium or a unique, updated, top of the line condo rental you and your family will be most comfortable while you stay at this North Myrtle Beach condo resort in South Carolina. Elliott Beach Rentals is not affiliated with onsite management or the HOA of Ocean Marsh.